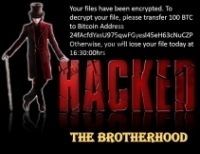 The successful entrance of The Brotherhood Ransomware does not go unnoticed because this infection encrypts files on affected computers right away. Luckily, it is not a prevalent infection, so it does not mean that you will necessarily encounter it. Of course, you cannot keep your computer unprotected. According to specialists working at pcthreat.com, it seems that The Brotherhood Ransomware is still in development, or it has been developed for testing purposes, so we cannot guarantee that cyber criminals will ever start spreading it actively. You must still keep security software installed on your computer to prevent it from entering your system. 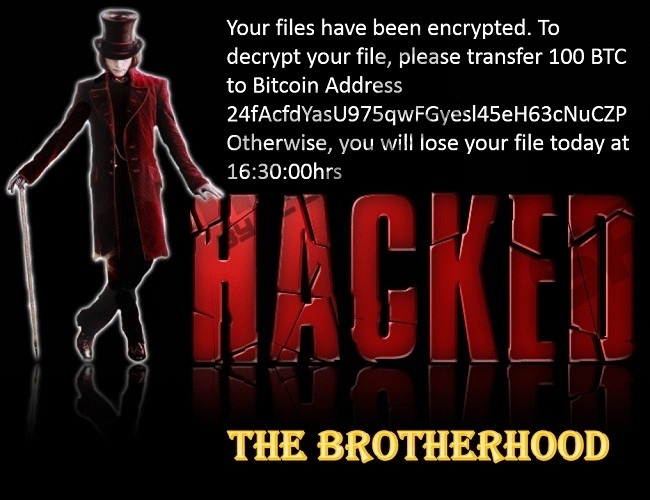 Have you already encountered The Brotherhood Ransomware? In this case, you must remove this infection from your system so that it could not lock more files. Research has revealed that this ransomware infection uses AES-256 to encrypt users’ personal files, so we are sure you would not want it to encrypt more files on your computer. In fact, the majority of ransomware infections use strong encryption algorithms to lock data because they seek to extract money from users. You are not allowed to transfer money to malicious software developers even if you have encountered an extremely nasty threat! Do not even think about sending 100 BTC to cyber criminals even if you have this amount of money in your bank account because your files might still stay encrypted. In this case, you could not do anything to force cyber criminals to send the decryptor to you. Even though free decryption software is not available, it does not mean that you could not do anything to fix those encrypted files if you do not pay a ransom. Specialists say that users can restore their files in no time from a backup they have. This does not cost a penny! Let’s talk about the distribution of The Brotherhood Ransomware. Of course, if you have already encountered it, you could not turn the clock back and prevent it from entering your system, but users who read this article out of curiosity still have a chance to protect their systems against this malicious application. The Brotherhood Ransomware was not distributed actively at the time of writing, but this might change soon, so we highly recommend that you stop opening suspicious emails and their attachments if you do not want to find it installed on your computer. Since malicious email attachments are only one of several different tactics that might be employed to spread ransomware, the installation of a reputable antimalware tool is a must. It does mean that you can continue downloading software from dubious websites or acting carelessly in a different way after you install a security tool on your computer. It is not that simple to decrypt those files encrypted by ransomware infections, so do not expect that they will all be unlocked after you fully delete The Brotherhood Ransomware from your computer. Speaking about the removal of this malicious application, you need to delete only two components belonging to it to erase it fully: 1) the malicious file launched and 2) the ransom note named RansomNote.jpg from Desktop. You can also delete this threat with an antimalware scanner. This is the removal method you should adopt if you are looking for a way to clean your system within seconds. Find the malicious file you have recently launched on your computer. Quick & tested solution for The Brotherhood Ransomware removal.